There’s always a scene in movies about some epic disaster during which an early warning system goes off. A young scientist believes a comet will hit the Earth but the older scientists tell him he’s nuts. A tsunami monitor goes off when there are calm seas and the woman watching it disregards the information. You know the drill. As the audience, we know that disaster is coming but those who have the information are blissfully unaware until disaster strikes. 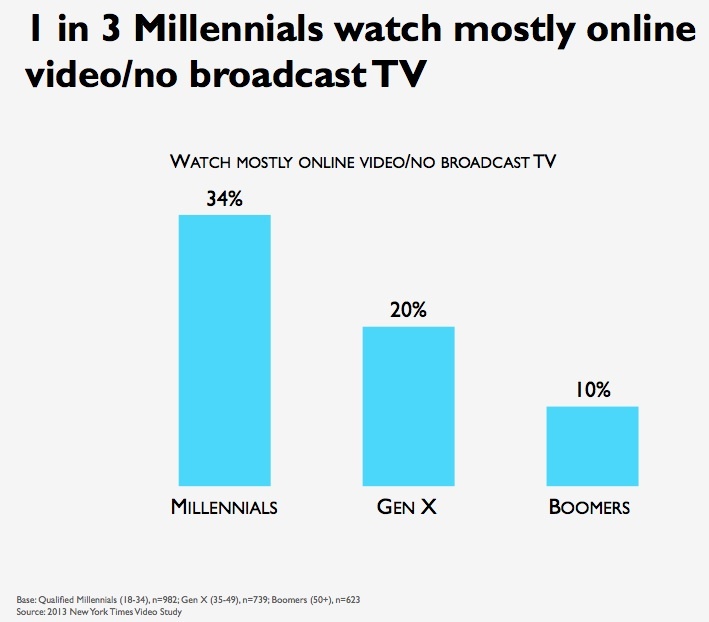 Thirty-four percent of millennials surveyed watch mostly online video or no broadcast television, new research from The New York Times says. While 3.2 million new U.S. households were set up in the last three years, the paid-TV industry only added 250,000 subscriptions in that same period. The Canadian government will soon require cable and satellite television providers to make it easier for customers to buy only the channels they want rather than pay for bundles, the country’s industry minister said on Sunday. Sound familiar? It should, since it’s the same fight that’s been brewing here for several years and which intensifies each time your cable or satellite bill goes up. Cable executive are rightly scared that their penetration into the household base will fall, making subscriber revenues drop and ad sales impossible. Young people tuning out in droves. The fundamental business model under attack. Have we reached the end of the TV world? Not yet. But in my mind the early warning systems are howling. What do you think? You know, now seems like a good time to add Rutgers and Maryland to the B1G precisely so the Big Ten Network can charge higher per-household rates in NYC and DC DMAs for people who will NOT watch Rutgers and Maryland. How long can this business model last? The pay TV lobbies are powerful, but technology is undercutting them at every turn.